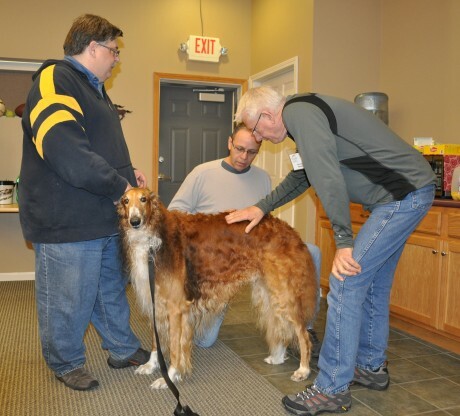 Animal Chiropractic has been a specialty for chiropractors and veterinarians for over 20 years. In order to be certified you must first hold a license in either profession and then attend a 215 hour course at one of the 3 certified animal chiropractic colleges. Once the doctor has completed this course work they will take an accrediting exam by the American Veterinarian Chiropractic Assoc. or the International Veterinarian Chiropractic Assoc. Schutzhund as you know is a very demanding sport and as such extends your dog beyond his normal day to day activity. As your dog goes through the Tracking, Obedience, and Protection there are various stresses placed upon him. This article will address those situations and give you a perspective on how you can improve their performance. Chiropractic addresses the movement of joints and the integrity of the nervous system which controls and coordinates the muscles. Remember muscles move joints and nerves control muscles so if a joint is stressed and locks out of position and or a muscle is overworked then your dog’s movement will be hampered. When this situation is not addressed compensation will occur and result in symptoms such as slower times, decreased performance, and possible lameness. Chiropractic evaluations take into consideration your dog’s activity and looks at the biomechanics of the joints and muscles to determine if a subluxation [joints that are ‘stuck in motion” causing nerve irritation] exists. Many times a subluxation will be present without symptoms and this is the best time to have your dog adjusted to prevent further complications. Many owners have their dog routinely checked by the chiropractor to reduce the probability of subluxation interfering with the dog’s health. How often should your dog be checked is purely dependent on their age and activity level. What causes subluxations is a very common question. Simply put, any stress such as physical, or emotional circumstances can ‘short circuit” the nervous system causing muscle tension and loss of movement within the spine. Just working on the muscles at this point will not free up the nerves and joints but rather adjusting the dog and doing specific exercises will correct the problem. One other important point to mention is the fact that 90 percent of all input to the nervous system comes from muscle activity. A situation in which a subluxation is present will alter this input. These same nerves connect with nerves that control organ function, so it is very plausible that a subluxation can cause other health issues beyond just movement. When your dog needs to move and corner a subluxation within the neck can cause decreased movement of the shoulder. The pelvis and sacroiliac control rear leg activity so a subluxation within the sacroiliac will decrease hind leg extension and flexion resulting in difficulty in movement. If a subluxation is within the cervical or thoracic spine your dog will have difficulty keeping the nose down. Heeling, picking up various weights, jumps and moving in a straight line will be affected when there are subluxations within the cervical spine [causing diminished ability to flex the head down and hold a weight in the mouth]. Subluxations within the lower back and pelvis will hinder jumping as well as cause your dog to have not moved in a straight line. The attack phase will put a huge compression force into the entire spine causing possible disc injury, joint locking and muscle strain. A subluxation can cause shearing stress on the discs leading to eventual disc bulge and or herniation. It should also be noted that a large force on the TMJ [jaw joint] will affect cervical [neck] movement along with the shoulder. Remember if your human chiropractor is not certified in animal chiropractic by the AVCA or IVCA then please do not allow them to adjust your dog. Methods of adjusting a dog are divided into two area one being by hand and the other is the activator. Hand adjusting allows the doctor to feel the adjustment better. Activator adjustments impart a force into the spine and movement hours later will hopefully allow the body to unlock the subluxated joint.